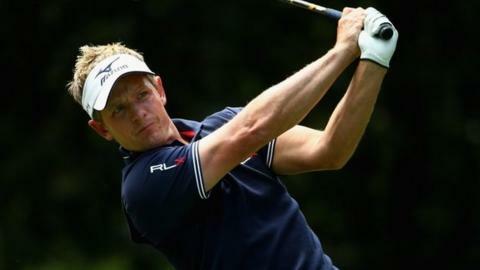 Luke Donald finished second at the RBC Heritage as Matt Kuchar's final-round 64 earned victory in South Carolina. The Englishman scored a 69 to trail Kuchar, 35, by one shot and beat third-placed Ben Martin and John Huh by one. After bogeying the 17th, Kuchar holed from a greenside bunker for a birdie at the last for a seven-under-par final round and 11 under par overall. It was so cool to see that thing disappear at the end. Donald was unable to gain the shot he needed from his final three holes to force a play-off with American Kuchar. After beginning the final round with a two-shot lead, Donald hit a wayward tee shot at the sixth before three-putting for a double bogey. Kuchar, who started the final round four adrift, posted seven birdies in his first 10 holes and followed with six pars before his spectacular chip-in at the last. "I wasn't too disappointed to end up in that front greenside bunker on 18," he said. "I knew it was a pretty easy up and down. I said 'I'm about due to make one of these' and it was so cool to see that thing disappear at the end." Donald, 36, was now one shot behind. Seeking his first PGA title since 2012, he missed a 28-foot birdie putt at 17 before his own chipped birdie attempt at the last missed by six inches. "I hit a lot of solid shots," he said, "a lot to build off and I'm excited about some of the changes I've been making." Scotland's Russell Knox registered a final-round 70 to finish joint ninth on five under par, while England's Paul Casey was tied for 18th place on three under. Northern Ireland's Graeme McDowell, the 2010 US Open champion, was joined by 19-year-old English amateur Matthew Fitzpatrick nine shots adrift at two under for a share of 23rd.